Both of these companies are well-known recliner brands and have been in business for years. In this article and video, we’ll take a look at five key differences between La-Z-Boy and Flexsteel. La-Z-Boy and Flexsteel carry a wide variety of recliners. They typically start at $399 then go up depending on the model, upholstery, etc. 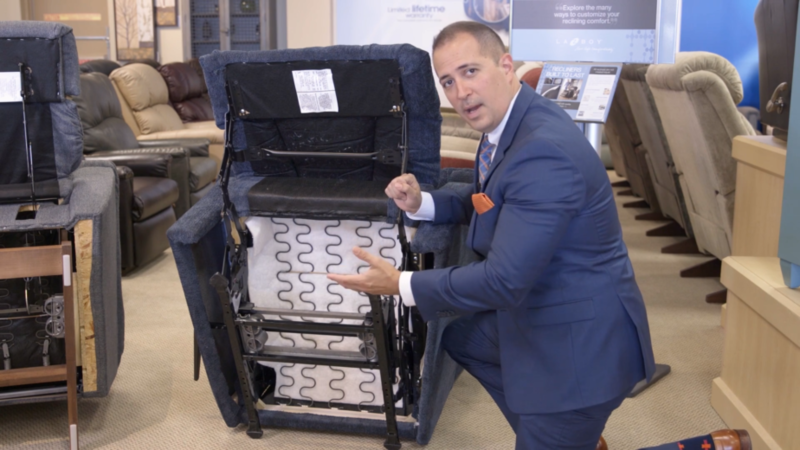 When you compare similar recliners in the same type of fabric or leather, you’ll find La-Z-Boy and Flexsteel cost nearly the same. Both of these recliners are made in America so your purchase will support your local community. 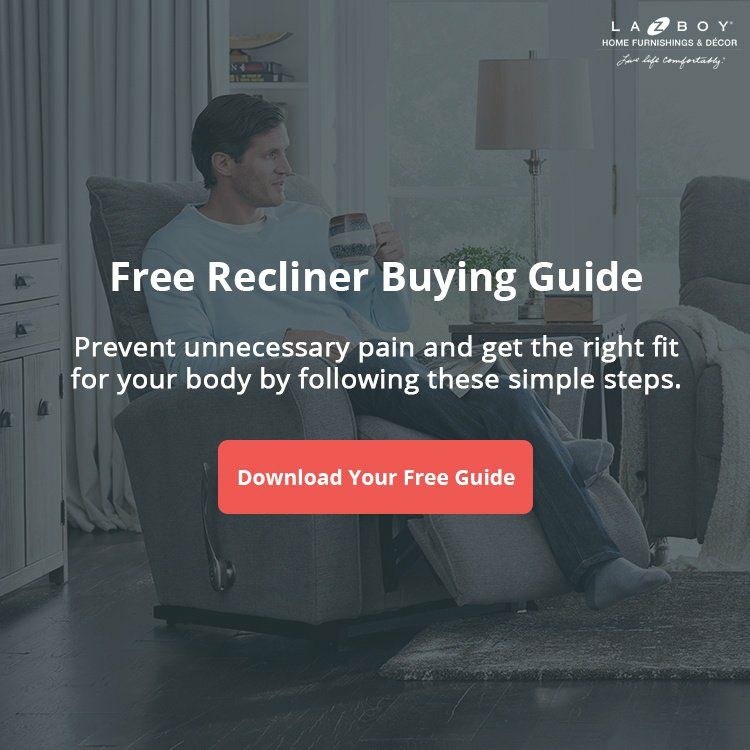 However, La-Z-Boy Recliners have several patented features and benefits you won’t find on any other recliner in the market. To see the first feature, we’ll need to take a look underneath both of these recliners. 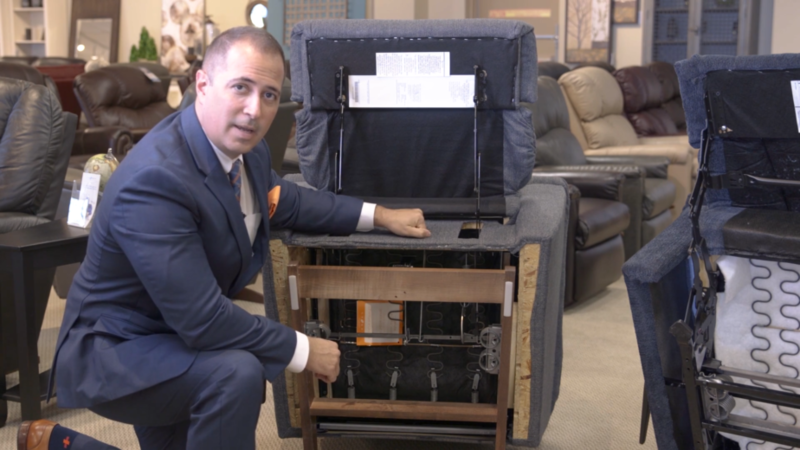 When you take a look underneath a La-Z-Boy and Flexsteel recliner, you’ll notice a big difference in the construction of the frame. La-Z-Boy Recliners have a four-sided frame with wood on the sides, back, and front. The fourth side on the front provides structural integrity so the frame won’t bend or bow when you push up to get out of your recliner. Flexsteel Recliners have a three-sided frame with wood only on the sides and back. You’ll notice there’s an empty space where the front side of the frame should be. Pushing up on the armrests will cause a three-sided frame to bend to support your weight. This will strain the reclining mechanisms and lead them to eventually break. Reclining the back of your chair puts your back in a comfortable angle while you sit. La-Z-Boy Recliners have a patented mechanism that allows you to recline your back without having to lift your footrest. In order to recline your back in any other recliner, you’ll have to put your feet up. Once your footrest is up, you won’t be able to rock back and forth until you put the footrest down. 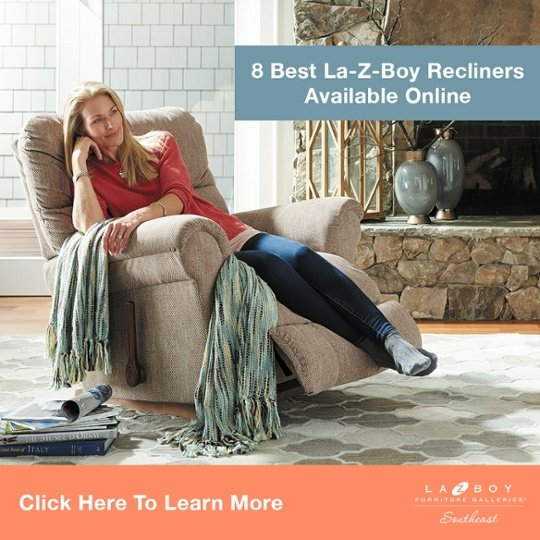 La-Z-Boy is the only recliner in the world that let’s you recline your back and rock at the same time. Most recliners have a spring loaded footrest that will fall when it receives enough pressure. La-Z-Boy has a dual locking footrest that will only go down when you release it with the handle. This means the footrest on your La-Z-Boy Recliner will only go down when you want it to. Safety is especially important if you have young children or pets playing around your footrest. The cushions on La-Z-Boy Recliners are filled with contour cut foam. Flexsteel fills the cushions on their recliners with stuffing. Using contour cut foam in recliners is another patented feature you’ll only find in a La-Z-Boy. La-Z-Boy Recliners and Flexsteel Recliners are made in America and their price points are typically very similar. However, there are several patented features and benefits you’ll only find on a La-Z-Boy Recliner. We’d be happy to help you find the best recliner for your unique needs at any of our locations in NC, SC, and GA. Subscribe to La-Z-Boy Southeast and receive immediate access to a Free Personal Style Analysis from our team of degreed interior designers! When Is the Best Time to Buy Living Room Furniture? 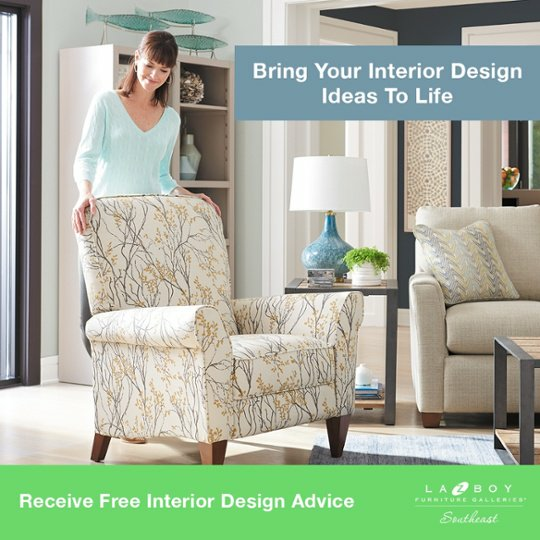 At La-Z-Boy Southeast, you can meet with a degreed interior designer for free! This free service makes furniture shopping fun and easy. Submit the form below to get started.